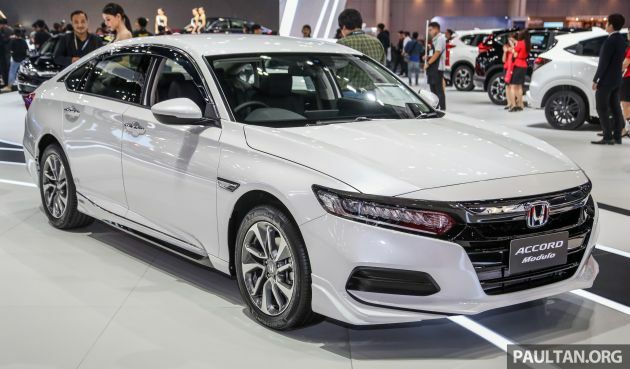 The latest Honda Accord is the most relevant new car at the 2019 Bangkok International Motor Show (BIMS), one that’s coming to Malaysia in the future. Yesterday, we showed you the tenth-generation Accord in its Thai market 1.5L Turbo and 2.0L Hybrid forms. Now, here’s the all-new D-segment sedan wearing the Modulo bodykit. Let’s start in front, where the Accord wears a thick chrome bar of a grille that also spreads into the headlamps as “wings”. The bar you see here is less shiny, thanks to the gloss black Modulo grille garnish. The front lip that eats into the fog lamp housings is actually standard, but the Modulo kit adds on layered bumper extensions on the sides. On the Accord’s new fastback profile, you’ll find fake side “gills” on the front wings with the Accord name on it, along with side skirts with dark chrome accents that match the grille. Also on are window visors. The car you see here the 1.5L Turbo that rides on 17-inch alloys, an inch smaller than the Hybrid’s rims. At the back, there’s a bootlid spoiler with the same dark accent. This goes on top of the standard spoiler that’s integrated into the boot design. No change on the rear bumper other than a chrome strip in the middle. Like the Civic FC, the Accord doesn’t have exposed exhaust tips – the real pipe points downward and is hidden away behind the bumper. We didn’t see anything new inside other than aluminium door scuff plates. To recap, the 2019 Accord boasts a fresh new look with a sweeping roofline not unlike the Civic. At 4,920 mm long and 1,860 mm wide, the new sedan is 10 mm shorter and 10 mm wider than before. That roofline sits 15 mm lower than before, while the 2,830 mm wheelbase is a significant 55 mm longer. The centre of gravity is 10 mm lower than before. The 2.0L and 2.4L naturally aspirated engines from the previous generation have made way for a 1.5 litre turbo engine and a 2.0 litre hybrid version. Similarly, the old car’s five-speed torque converter auto is no more – the range is now CVT-only. Three variants are available in Thailand – the Turbo EL for 1.5 million baht (RM192,844), the Hybrid for 1.65 million baht (RM212,129) and the Hybrid Tech for another 150k baht (RM19,282) extra. For more on the Thai-market Accord, check out our previous post. We’ve also showed you the kitted-up Toyota Camry TRD Sportivo, which like the original car, is more of an extrovert compared to the Accord – which do you think looks better? The post Bangkok 2019: Honda Accord Modulo, a subtle bodykit appeared first on Paul Tan's Automotive News. 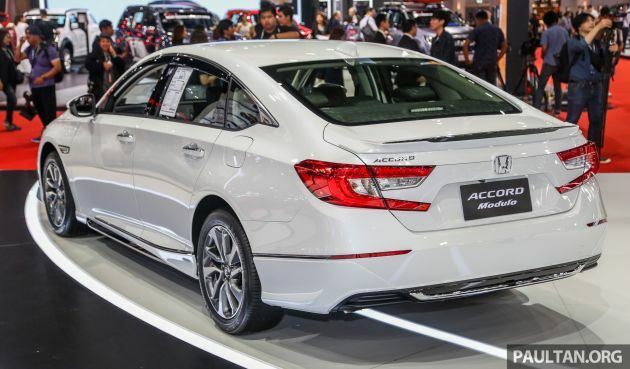 0 Response to "Bangkok 2019: Honda Accord Modulo, a subtle bodykit"